Believe it or not, these photos are real, not fakes. That's what the authors say. Excluding cropping or tone adjustments, none of these images have been Photoshopped (as in composed from many images or morphed or painted over). I look at them and I can believe them. Hmmmm. I mean. Kind of. What do you think? Some of the photos are just well staged. Some others are good optical illusions. There are a couple that are supposed to be just (very) happy coincidences, like the golf ball above. Or is it? Staged in the sea while they waited for a wave and the surfer to be in the right position (patience!) or two photos merged in one (effortless)? Intentional fall about to happen (painful) or man pasted on top with fake shadow (no hip broken)? Car painted over in real life (expensive and complicated) or painted later in Photoshop (so easy and cheap)? Staged in a stadium (lots of hard coordination here) or composed and sightly morphed later in Photoshop (no headaches)? Happy coincidence to get this surreal reflection (magic!) or some crazy layer work (more magic!)? A woman posing over a real miniature model of a street (building that is hard) or pasted on a tilt-shifted city landscape (masking and composing is so easy)? 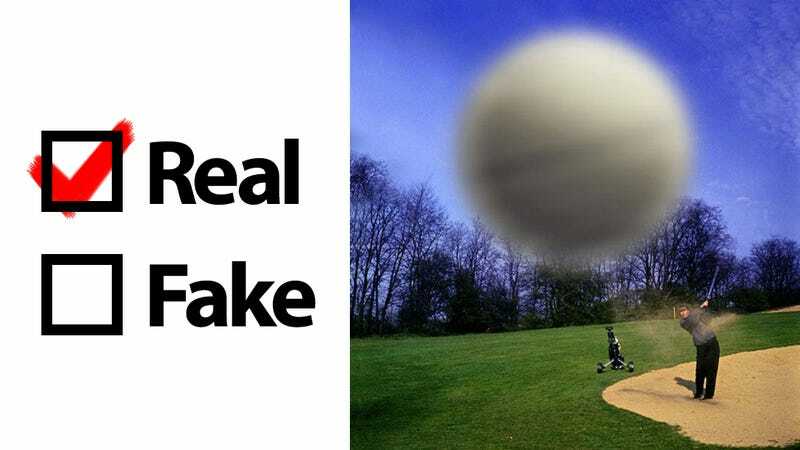 Do you have more examples of real photos that totally look like fakes (or the contrary)? Post them in the comments.